18 pp. Roman, 527 pp. Many questions concerning reflexivity in Kiswahili still have not been answered adequately. The intention of this study is to determine what reflexives are in Kiswahili and to understand their nature and functions. The implications of the reflexive study found in this book, have never before been undertaken elsewhere. The work therefore queries the claims of corporate linguistic theories and models on the subject of argument structure, transitiveness, binding and anaphor relations in grammars. It also challenges the salient claims of syntactic theory generally regarding subject versus object relations in Kiswahili syntax and ultimately in general linguistics. There are four linguistic units in Kiswahili that qualify as reflexive or reflexive-like markers: one adjectival stem, two nouns, and one affix. 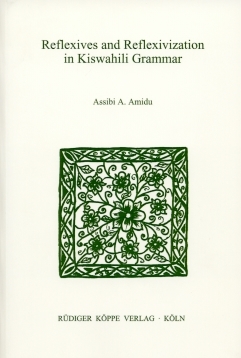 Because of the diversity of these expressions which are all glossed self in traditional descriptions, the present book is also a work about syntactic patterns and relations, about transitivity, the status of class affixes in the grammar, and the consequences for Kiswahili syntax and the morphology of classes. This work is aimed at researchers who are interested in exploring the interface between syntactic structures or patternings, on one side, and class morphology and micro-syntax, on the other. It is also useful to advanced students and scholars who are interested in Kiswahili or Bantu studies, or in linguistics in general. To summarize, the book is a monumental work, the first that offers an exhaustive description of reflexivity in Kiswahili. Its structure is transparent and the discussion coherent. Amidu presents new insights supported by ample and competent evidence. I share the author's hope that "[...] this book, however controversial it may be, will be assessed on the basis of its objectives, and above all, on the basis of its novelty and insights" (p. xiii). Certainly, Amidu's findings expand our knowledge and shed new light on the issue of reflexivity in Bantu.